In a major breakthrough, three Babbar Khalsa terrorists, including its India operations chief Paramjit Singh Bheora, who was involved in the assassination of Punjab Chief Minister Beant Singh, were arrested in north-west Delhi early this morning. 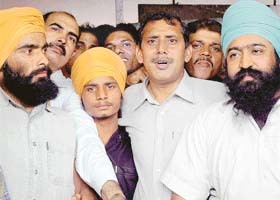 Paramjit Singh Bheora (right), chief of operations of Babbar Khalsa in India and his accomplices Jasbir Singh and Bhupinder Singh, being produced in the Tis Hazari Courts in Delhi on Monday. Should users be punished for running polluting power generators? It may sound incredible, but it is true. The Punjab Government sells bhang, a narcotic drug prepared from the leaves and flowers of the hemp plant also known as cannabis. However, in local parlance, hemp plants are called “sukha”. Hashish, a strong and costly drug, is also prepared from hemp plants. Union Ministers Arjun Singh, Sushil Kumar Shinde, Praful Patel, Hansraj Bhardwaj, and Dasari Narayan Rao are among the political heavyweights who were elected unopposed to the Rajya Sabha today. The deadline for withdrawal of nominations ended today for the biennial elections to fill 59 seats from 15 states. Dr V. Kurien, father of the milk revolution in India, resigned from the chairmanship of the Gujarat Cooperative Milk Marketing Federation here today. “My decision is in deference to the recent order of the Gujarat High Court on the issue of co-option of members on the management committee of the cooperative bodies in the state. Prime Minister Manmohan Singh today said that he would go to Srinagar in May as part of efforts by the Centre to broadbase the dialogue process on Kashmir. Having served the co-operative dairy sector for over five decades with dedication and commitment, do I deserve this kind of treatment from the board members. With Prime Minister Manmohan Singh favouring full float of the rupee, Finance Minister P. Chidambaram said today the government and the RBI would in the next few days announce steps on capital account convertibility of the Indian currency. India raised faint hopes of hitting back at England by knocking out both the English openers towards the end of the third day’s play in the third cricket Test here today after conceding a first-innings lead of 121. It was a day of cheers for India with the shooters grabbing three gold and the men’s table tennis team scripting history by crowing themselves champion at the 18th Commonwealth Games here today.